Have a question about dog surfing? How can I learn to surf? Where can I go to surf with my dog? She has all the answers! Just fill out the form on the left! We'll post Nani's answers HERE! I want to know if dogs can get stung, I have not been able to find any info on this and I thought you guys would be the ones to know! Yes, I suppose that someday a dog will get stung by a stingray. 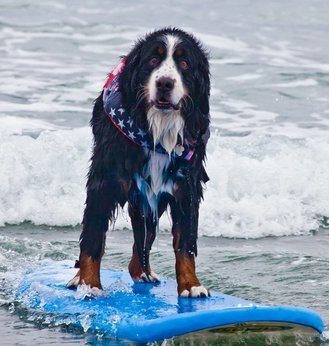 Can’t tell you why, but in the 5 years I’ve been surfing with my Surf Dog Nani and other members of the SoCal Surf Dogs, she (and the other Surf Dogs) has never been stung! I have 3 times! A few other Owners have too! We even started a ‘S Ray Club’ to document the stings. ride the wave all the way to the beach, thus limiting their exposure to the risk! Hope that answers your question!